To create awareness among common people about cyber laws a new book ‘Cyber laws in the Information Technology Age’ was released in Delhi on Wednesday evening. 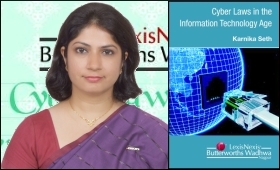 This book authored by Karnika Seth, Cyber-lawyer & Managing Partner of Seth Associates law, presents an insight into different interesting cyberspace issues such as online privacy, defamation, freedom of speech on internet, intellectual property piracy on internet, and cyber crime with case studies and landmark precedents from different parts of the world. It provides practical tips on safeguarding one’s security and privacy in the online world and will enlighten readers on their legal rights and obligations in cyberspace and legal implications of their actions on the Internet. Butterworths lexisnexis Wadhwa in collaboration with the Karnika Seth has launched this book. The Book was released by Justice Altamas Kabir, Judge, Supreme Court of India. Justice Dalveer Bhandari , Judge Supreme Court of India, Gopal Subramanium, Solicitor General of India , Indira Jai Singh, Additional Solicitor General of India and Gulshan Rai, Director General , CERT, Ministry of Information Technology also graced the occasion and delivered their address at the book release function. “The prime objective of this book is to introduce its readers to the subjects of cyber laws, elucidate key operative principles and to discuss the key developments in the field of Cyber laws across many important jurisdictions India, United States and European nations,” said Karnika Seth. The book also discusses pertinent e-contracting and e-commerce issues, and describes popular e-payment systems and taxation regimes which are indispensable to e-commerce businesses. “It elucidates the key principles for determining jurisdiction in cyber law disputes, significance of electronic signatures and admissibility of e-evidence, which are subjects of interest to readers’ world over,” the author added.